I first met Anthony Burgess on Election Night 1966. As the then editor of the Penguin English Library I had commissioned him to write the introduction to one of the classic English novels. We met in the bar of the Café Royal. Burgess arrived with his then wife, Lynne. We chatted pleasantly for a while and then they invited me back to their house in Chiswick to have supper and watch the election results. I naturally agreed and we sat up until the small hours in very merry mood. (I believe Burgess favoured the Conservatives or at least disliked them less than their opponents). At a very late hour they offered me a bed for what remained of the night, which I gratefully accepted. I very much hope I hadn’t outstayed my welcome but if I had they were extremely gracious about it. We kept in touch after that night and maintained a friendly relationship for many years. Some years later, now working as an editor at Hutchinson, I acquired the rights in his novel Earthly Powers and published that and several of the novels that succeeded it. At about that time he and his wife Liana moved to Monte Carlo but I continued to see him on his visits to London. On all the occasions when I met him I was astonished at the sheer range of his talk. On one occasion Hutchinson arranged a dinner in his honour at one of the London clubs. Burgess came to the office first and when the taxi arrived to talk us on the the club I offered a lift to the editor of our sports books. As soon as I introduced the two Burgess began to speak with knowledgeable enthusiasm about the best sports writers of the day and the two of them quickly bonded. Later, at the club, when we had finished dinner, as if at a signal, Burgess began to talk. He talked fluently, without notes, and in perfectly formed sentences, for perhaps twenty minutes. We were utterly enthralled, yet by the next day I couldn’t remember a word he had said. I think that might be true of all his talk, and perhaps of much of his writing too. I believe most of his many novels are currently out of print. The one that is still remembered is A Clockwork Orange and that perhaps only for its title and the notorious film that was made of it. Yet though A Clockwork Orange may not be his best book, if it isn’t I’m not sure what is. 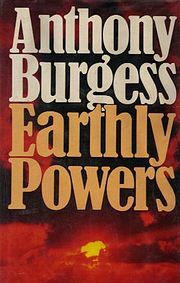 At that Election Night meeting I learned that Anthony Burgess’s real name was John Anthony Burgess Wilson and his friends knew him as John. Thenceforth in all my dealings with him I called him John too. But I have always felt that the man I met was Anthony Burgess, the brilliant writer and the amazing, erudite, endlessly entertaining talker. John Anthony Burgess Wilson may have been there somewhere in the background, but I don’t believe I ever met him. James Cochrane was born in Edinburgh in 1938 and educated there and at Cambridge University. He joined Penguin Books as an editor in 1961 and has worked in publishing ever since. He is the author of Between You and I: A Little Book of Bad English (2004).